This family of instruments consists of three branches: baritone, euphonium, and double bell euphonium. The baritone, or baritone horn, is the smallest member of the family. (Occasionally its name is applied to a type of euphonium.) It is used in brass bands routinely, but is seldom seen in wind bands. The euphonium is the instrument commonly used in American wind bands. The double-bell euphonium is no longer made, although many still exist in playing condition. Each member of the euphonium family possesses design features that clearly differentiate it from the others. Each has virtues that are valuable in some context. I chose to use all three in my recent Masters Recital at the University of Connecticut in order to demonstrate the differences among them and advantages of each. A secondary reason for using all three instruments was my desire to alleviate the confusion many people have in distinguishing between baritone and euphonium. The next major developments were in the early 1840s. "Adolphe Sax invented a complete range of piston-valved brass instruments in Paris from 1842-1845. These were used in England also, and helped fuel the brass band movement. They are credited as the first generation of modern low brass instruments. "4 These new musical instruments used piston valves, while most previous valves used a more complicated rotary mechanism. The piston valves had a faster action enabling the performer greater facility. There was one other significant development during this period: "In 1843 Sommer of Weimar invented the Euphonion. "5 Some sources credit it as the first modern euphonium. During informal research I did 15 years ago, I consulted 20 reference books for definitions of euphonium. About half of these sources traced the lineage to Sommer and the others to Sax. In either case it is clear that even the earliest euphoniums had a large bore and conical tubing, giving them a smooth, voluminous sound. The euphonium's name is derived from Latin and Greek words than mean "sweet-voiced" or "sweet-sounding. "6 As brass instruments improved over the next three decades, the smaller-bore baritone and larger-bore euphonium maintained their own identities. In many ensembles there were separate parts for each instrument. Immutable physical laws caused intonation anomalies that designers sought to overcome. "The [intonation] errors arising from the use of valves in combination are present in all valve instruments which have no provision for compensation and amount to .52 of a semitone sharp in a three valve instrument and just about 1 3/4 semitones sharp where the chromatic scale is extended down to the pedal octave by the use of a fourth valve. 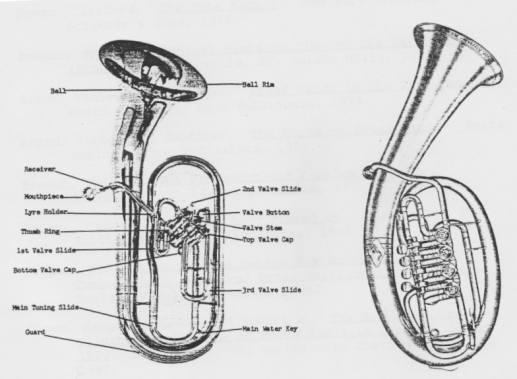 "7 Various solutions were tried, but none were as accepted by players as the Blaikley compensating system, which is still standard on high-quality baritones and euphoniums today. "The most effective solution of all for the euphonium is the system of automatic compensation designed by David J. Blaikley for the Boosey company in 1874. "8 Blaikley's compensating system was implemented on instruments that are visually similar to today's versions. The design featured an upright bell pointing to the player's right and valves that pointed in the same direction. In the early 20th century, American manufacturers developed a modification of what had become the standard euphonium design. This new variant had a bell that pointed to the player's left, and was sometimes curved forward, as seen in Illustration 4. The valves were perpendicular to the main tubing of the euphonium. It had a slightly smaller bore (but with similar taper) compared to the older euphonium design. It was intended to fill the gap between euphonium and baritone, supposedly being able to perform either role. However, it soon came to be used as a euphonium. It was the standard euphonium design in public school bands until about 1980, when the traditional design began to gain favor despite its higher cost. Some European countries (especially Germany and Austria) developed a design similar to the American instrument except with rotary valves and a more oval appearance. This design is still in use today, particularly in the role of a tenor tuba. It has been shunned by soloists because of the slower action of its rotary valves (see Illustration 4). In the euphonium's early days a wide variety of brass ensembles existed. There was considerable experimentation with various combinations of instruments, but it was to last only a short time. With the development of Sax's line of instruments in the 1840s, two forms of band were destined to materialize: the brass band and the wind band (or concert band). The euphonium immediately found an important and secure position in each of these ensembles. Brass bands have always been a strong force in Europe, but they virtually disappeared from the United States until recently. "At present, brass bands, modeled on the British tradition, are gaining popularity. "14 This rebirth has been driven by the formation of the North American Brass Band Association. At present there are nearly two hundred amateur brass bands in this country and at least one professional brass band. Such lists are valuable encouragement for euphoniumists, but would offer only occasional employment. There is a problem with nomenclature in these excerpts--the label "tenor tuba" or "tuben" on many of these parts can mean either a high-voice tuba or a low-voice horn. In the latter case, the parts are best left to the so-called "Wagner tuba," which is usually played by a utility horn player. The euphonium serves very comfortably as a high member of the tuba section, and is particularly suited to tenor tuba parts with substantial melodic content, such as Shostakovitch's Age of Gold suite or Mahler's Symphony No.7. "It appears in the symphony orchestra under the German name Tenorhorn in Mahler's seventh symphony where, during the first movement, it plays an extremely important and exposed solo part, notable for a striking entry in the second bar of the work. The compass is concert B-b1, written in transposed treble clef. "22 Most euphoniumists would need to adjust their style somewhat to fit into the orchestral texture. When serving as a tenor tubist, the amount of vibrato a euphonium player uses during band playing will likely sound inappropriate. The euphonium has been used sparingly in jazz or commercial music. It is (very) occasionally used in pit orchestras. For example, euphonium has a brief role in John Barry's musical Drury Lane23 and in Roger Miller's Broadway musical Big River. It is also featured briefly in a few movie scores. Henry Mancini used euphonium in at least three of his scores: What Did You Do in the War, Daddy? ; Heaven Can Wait; and Oklahoma Crude. In pit orchestras or in movie studio orchestras, the euphonium part is almost certain to be played by one of the trombonists for the brief time it is used. On rare occasions, the euphonium is used in popular music. The first instance I can document is Jackie De Shannon's What the World Needs Now Is Love.24 The euphonium is used the opening solo (sounding the theme before the vocalist) and in counter-melodies later in the arrangement. It has also been used in recordings by Carole King and Paul Simon. Gus Mancuso and Rich Matteson have made considerable use of euphonium in jazz combos. Other jazz personalities such as Maynard Ferguson have used euphonium occasionally for effect. For the purpose of considering appropriate uses and scoring, it is safe to consider the American euphonium and traditional upright euphonium to be the same instrument. The baritone should be regarded as a separate voice, and the double-bell euphonium can be viewed as a novelty (no manufacturer has produced one in years). Denis Wright describes typical scoring considerations for baritones: "If an orchestral parallel were required, one could consider the baritones in the same light as the violas, except that the two baritones will usually have two independent parts. In the hands of a good player the instrument is extremely flexible; lighter in tone than the euphonium, it can play arpeggio passages well, assist euphonium in melodic or counter-melodic work or provide sustained chords or quaver accompaniments in conjunction with the horns. 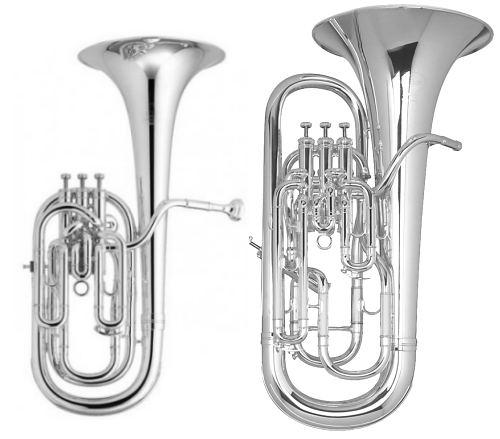 "25 And for euphoniums: "The euphonium is essentially likened to the orchestral cello. An excellent soloist throughout a range of at least two octaves, with a warm full tone. In the military band the euphonium is employed very considerably in doubling the bass, with occasional excursions into counter-melodies and solos. "26 Wright's expertise is scoring for the brass band, but his basic understanding of the characteristics of the two instruments applies to wind band scoring as well. The baritone horn has a fairly light tone and is not capable of great volume. It blends well with horns, trombones or euphoniums, and is a valuable supporting voice. In brass bands it is often used to impart a rounder sound to trombones or horns or to give the euphoniums more definition. It can also be valuable in a solo or recital setting. On my recital, I used a baritone for Concert Etude by Goedicke, which was originally written for trumpet. The baritone's lighter sound seemed more appropriate for some of the double-tongued passages (although balance problems in the hall made this advantage less obvious to the audience). I have also used it to good advantage when performing my own arrangement of Elgar's Salut d'Amor, which was originally a violin parlor piece. In its most common setting within the wind band, euphonium is used in a role similar to that of the cello in orchestral scoring. In fact, it is often called "the cello of the band. "30 In many band pieces that were transcribed from orchestra music, the euphonium plays solos that were originally for cello. Two common examples are found in Roman Carnival Overture by Berlioz, transcribed by Leidzen, and "New World" Symphony by Dvorak, transcribed by Safranek. The euphonium doesn't sound like a cello in either case, but it has the proper agility for the Dvorak and the required melodic ability for the Berlioz. In the best original band literature the euphonium is used in similar roles. One of the finest examples in traditional repertoire is the solo in the first movement of the Second Suite in F for Military Band by Holst. It is a flowing melody taken from a British folk song, and is an excellent showcase for the euphonium. Several contemporary composers have included fine solos for euphonium in their works for band, including Roger Nixon, Claude Smith, Arnold Schoenberg, Ingolf Dahl, and Morton Gould. Unfortunately, many modern composers are inclined to write only for the orchestral brass instruments in their works for band. If a euphonium part is included at all, it is set in a very subservient role, often as a tenor tuba with no melodic or counter-melodic opportunities. The instrument works well as a tenor tuba, but restricting it to that role wastes a valuable resource. In traditional brass bands baritones and euphoniums are well used. The parts take advantage of the instruments' strengths and avoid their weaknesses. Baritones are used to supplement the horns or trombones, and euphoniums assume the role described previously for wind bands. Both are key instruments in brass band instrumentation. In this scoring the baritones are not coupled with euphoniums, but rather are a part of the horn/trombone choir. The wealth of good literature for brass band is overwhelming. Not only are there abundant transcriptions, but many gifted composers are currently writing for brass band. Their music is more evolutionary than revolutionary in style, and is usually classified as "neo-romantic." No discussion of euphonium scoring would be complete without a mention of chamber ensembles. The most popular setting for euphonium in chamber music is in combination with tubas in a euphonium-tuba ensemble (sometimes simply called a tuba ensemble). The blend of these large-bore conical instruments is extraordinary, although care must be taken to keep the writing in a high enough range to avoid a muddy texture. While year-round employment for euphonium players is rare outside military bands, four-part euphonium-tuba ensembles are employed at Disney theme parks and occasionally at other parks. Euphonium is also used advantageously as a bass or melody instrument in a brass quartet. Both types of ensemble have a large body of music available. According to Denis Winter's Euphonium Music Guide,33 there are 16 recordings available of euphonium-tuba ensembles and four of brass quartets. For at least the past several decades, the euphonium has been a somewhat misunderstood instrument. Most American non-musicians have never heard of it, although some have heard of the baritone horn. In England, however, "euphonium" is a fairly well known word. During a trip there in 1980, my wife commented to our cab driver that I was in London to accept an award for euphonium playing. His response was, "Oh, yeah? I just heard a euphonium soloist on the telly [meaning "television"] the other night." I have yet to have a similar experience in the United States. The definitions summarized above show some consistency of opinion about the main features that define the instruments. Euphonium has a larger bore and a larger tone than baritone. One source mentions the deeper mouthpiece that is usually used for euphonium, and another correctly identifies a difference in taper of the tubing (flugelhorn has a wider taper than cornet, in the same manner that euphonium has a wider taper than cornet). The amount of taper is easily judged without measurements. True baritones have a very small amount of taper, so that the tubing in the final bend before the bell is still very narrow. In a euphonium, this tubing is roughly twice as wide. While the bore size contributes to tone quality, the taper is probably more significant. Consider the double-bell euphonium. The valve that selects which bell will play is located after the point where bore size is measured. The differences in dimensions after this valve consist solely of the amount of tubing taper and subsequent bell size: wide taper and large bell versus narrow taper and small bell. The sound of the two bells is very different despite the fact that they are both played through the same mouthpiece, leadpipe, and bore. Therefore, it seems obvious that the degree of taper must be considered when assigning the term "baritone" or "euphonium." Unfortunately, most reference books mention differences in bore and few mention differences in taper. Some mention the number of valves, but this feature is a reflection of practical considerations of how the players use the instruments. A baritone could be built with four valves (although I don't know of any that are), and euphoniums are frequently made with only three valves. Famous euphonium soloist Arthur Lehman understands the construction particulars that are significant, and expresses his definition in 11 words: "It all lies in the shape and size of the tubing. "38 Illustration 2 at the end of this paper shows a baritone and a euphonium for visual comparison. In the 1970s there was a movement in this country to call euphonium a tenor tuba. The effort was short-lived, fading as euphoniumists began to gain a stronger identity. Euphoniums perform a tenor tuba role in many types of music and manage the task quite well. According to Bevan, ". . .'tenor tuba' is sometimes used in English-speaking countries when referring to a group of tubas in various pitches: it is then generally applied to both euphoniums and baritones as opposed to the bass tubas of lower pitch. "43 However, it may be more appropriate to use the term "tenor tuba" to define a musical role rather than an instrument. For my recital, I tried to use the baritone, euphonium, and double-bell euphonium for music that was suited to each. I chose the baritone horn for Goedicke's Concert Etude, a piece originally written for trumpet. As such, the music stayed out of the lowest range, which is consistent with the baritone's weak low register (its smaller bore and cylindrical tubing add resistance to the flow of air and make it more difficult for the player to produce low notes). The restricted air flow made one of the low range double-tonguing passages more difficult, but probably no more so than it would be on trumpet. The only other piece on the recital that would have fit the range limitations of the baritone was Vizzutti's Cascades (also originally written for trumpet). However, my interpretation of Cascades called for several sudden, wide dynamic changes. Such dynamics are more effective on euphonium--its wider bore gives it a very large dynamic range. The rest of the pieces on the recital required a low range that is beyond the scope of the baritone. I arranged Schubert's Arpeggione Sonata specifically around the extended abilities of the euphonium--its mellow sound, low register, and expressive capabilities make it a good choice for this demanding piece. Two of the other pieces, Goldsmith's Pastorale and Kellaway's Morning Song, were written for tuba. However, the range of either one falls within the recommended tessitura for euphonium. In fact, from the standpoint of range alone, Morning Song is much better suited to euphonium than tuba--it requires a B-flat above middle C, which is uncomfortable or impossible for most tubists. The Sparke Fantasy was written for euphonium by a composer who is intimately familiar with the instrument's abilities. There was no reason to select any other instrument for performance. All the music mentioned in this paragraph could be played on a double-bell euphonium. However, modern euphoniums feature improved intonation, tone, and general "playability" compared to the now-extinct double-bell euphoniums. Virtuoso solos such as the Arban Carnival of Venice were written as a showcase for experienced players who are expected to perform them in a manner that will leave the audience breathless. The extra aural and visual impact of a double-bell euphonium is an appropriate enhancement for such a piece. In most of the variations I chose to create a simple dialog, alternating phrases between the two bells as the music seemed to dictate. However, in the second triple-tonguing variation it seemed more effective to play the entire first half of the variation on the large bell in order to take advantage of its greater volume potential in accenting the melody notes. Then it was appropriate to stay on the small bell for the second half of that variation. I used a "wa-wa" effect on the slow variation, which was probably not used by soloists during the era in which double-euphoniums were first being introduced. In the final variation, which consists of 32nd notes, I played only the melody notes on the small bell in order to exaggerate the "duet" effect. While it cannot be documented, this was almost certainly an effect used by the euphonium soloists of a hundred years ago. The euphonium family is a valuable asset in today's music world. In order to encourage composers to use it to the best advantage and to educate listeners about the instruments, it is necessary to present them as often as possible to the public. I intend to continue to use the various instruments in public performance and to encourage other artists to do the same. Ultimately, it may be possible for a euphoniumist to become a professional recitalist, which would bring the instrument before a new audience. I would like to have the experience of hearing a taxi driver reply, "Oh yeah? A euphonium? Wasn't there a euphonium recital in town just the other night?" 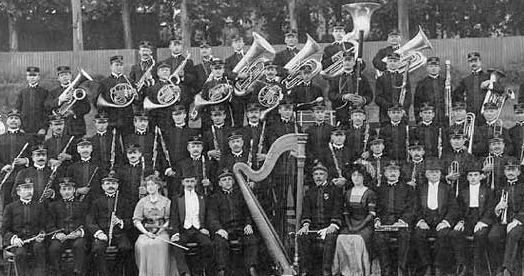 Photo showing the Sousa Band's instrumentation in 1911.44 Notice the two double-bell euphoniums. Photo showing a baritone and a euphonium.45 Notice the difference in taper of the tubing, easily compared at the last curve before the bell. Arnold, Denis, ed. The New Oxford Companion to Music. Oxford: Oxford University Press, 1983. Bevan, Clifford. The Tuba Family. New York: Charles Scribner's Sons, 1978. Bowman, Brian. Practical Hints on Playing the Baritone (Euphonium). Melville, NY: Belwin Mills, 1983. Brand, Violet and Geoffrey. Brass Bands in the 20th Century. Herts, England: Egon Publishers, 1979. Brand, Violet and Geoffrey. The World of Brass Bands. Herts, England: Egon Publishers, 1986. Brasch, Harold. The Euphonium and 4-Valve Brasses. Arlington, VA: Harold T. Brasch, 1971. Bryant, Carolyn. And the Band Played On. Washington, DC: Smithsonian Institution Press, 1963. Draper, F.C. Notes on the Besson System of Automatic Compensation of Valved Brass Instruments. Middlesex, England: Besson & Company, 1953. Hazen, Margaret Hindle and Robert M. The Music Men, an Illustrated History of Brass Bands in America, 1800-1920. Washington, DC: Smithsonian Institution Press, 1987. Lehman, Arthur. The Art of Euphonium Playing. Poughkeepsie, NY: Bob Hoe, 1977. Randel, Don Michael, ed. The New Harvard Dictionary of Music. Cambridge, MA: Belknap Press of Harvard University Press, 1986. Sadie, Stanley, ed. The New Grove Dictionary of Music and Musicians. London: Macmillan Publishers, 1980. Skeat, Walter W. A Concise Etymological Dictionary of the English Language. New York: Perigee Books, 1980. Thompson, Oscar, ed. International Cyclopedia of Music and Musicians. New York: Dodd, Mead and Company, 1985. Whitener, Scott. A Complete Guide to Brass. New York: Schirmer Books, 1990. Winter, Denis. Euphonium Music Guide. New London, CT: Whaling Music Publishers, 1986. Wright, Denis. Scoring for Brass Band. London: Studio Music Company, 1986. Louder, Earle L. "An Historical Lineage of the Modern Baritone Horn and Euphonium." Ph.D. diss., Florida State University School of Music, 1976. Bourgeois, Derek. "Composers Speak." British Bandsman: The World of Euphonium, No. 1 (1991): 3. Horovitz, Joseph. "Composers Speak." British Bandsman: The World of Euphonium, No. 1 (1991): 3. Kimpton, Jeffrey, ed. "Music in the Great Northwest: The Oregon Adult Band Festival." Published in the Yamaha Corporation newsletter New Ways, 8, No. 2 (Winter 1993). C-12. Petersen, Mary. "A Brief History of the Euphonium." The Instrumentalist, Vol. 35, No. 10 (May 1979): 16. Bacharach, Burt and Hal David: "What the World Needs Now Is Love." Performed by Jackie De Shannon, 45rpm single 66110, I.M. Imperial, ca.1962. 1. Clifford Bevan, The Tuba Family (New York: Charles Scribner's Sons, 1978), 90-93. 2. Mary Petersen, "A Brief History of the Euphonium," The Instrumentalist, 35, No. 10 (May 1979): 16. 4. Scott Whitener, A Complete Guide to Brass. (New York: Schirmer Books, 1990), 101. 6. Walter W. Skeat, A Concise Etymological Dictionary of the English Language. (New York: Perigee Books, 1980), 172. 7. F.C. Draper, Notes on the Besson System of Automatic Compensation of Valved Brass Instruments. (Middlesex, England: Besson & Company, 1953), 5. 9. Mary Petersen, "A Brief History of the Euphonium," The Instrumentalist, 35, No. 10 (May 1979): 16. 11. Margaret Hindle and Robert M. Hazen, The Music Men, an Illustrated History of Brass Bands in America, 1800-1920. (Washington, DC: Smithsonian Institution Press, 1987), 96. 13. Violet and Geoffrey Brand, Brass Bands in the 20th Century. (Herts, England: Egon Publishers, 1979), 20, 29. 16. Carolyn Bryant, And the Band Played On. (Washington, DC: Smithsonian Institution Press, 1963), 29-30. 17. Violet and Geoffrey Brand, The World of Brass Bands. (Herts, England: Egon Publishers, 1986), 88. 18. Jeffrey Kimpton, ed., "Music in the Great Northwest: The Oregon Adult Band Festival." New Ways, 8, No. 2 (Winter 1993), c-12. 21. Denis Winter, Euphonium Music Guide. (New London, CT: Whaling Music Publishers, 1986), 11-2. 24. Burt Bacharach-Hal David, "What the World Needs Now Is Love." Jackie De Shannon (45rpm single), I.M. Imperial 66110. 25. Denis Wright, Scoring for Brass Band. (London: Studio Music Company, 1986), 24. 34. Stanley Sadie, ed. The New Grove Dictionary of Music and Musicians. (London: MacMillan, 1980), vol.2 p.161, vol.6 p.293. 35. Oscar Thompson, ed. International Cyclopedia of Music and Musicians. (New York: Dodd, Mead & Co., 1985), 147, 657. 36. Don Michael Randel, ed. The New Harvard Dictionary of Music. (Cambridge, MA: Belknap Press of Harvard University Press, 1986), 294. 37. Denis Arnold, ed. New Oxford Companion to Music. (Oxford: Oxford University Press, 1983), vol.1 p.172, 648. 38. Arthur Lehman, The Art of Euphonium Playing. (Poughkeepsie, NY: Bob Hoe, 1977), 55. 39. Brand, Brass Bands in the 20th Century, 34. 40. Brian Bowman, Practical Hints on Playing the Baritone (Euphonium). (Melville, NY: Belwin Mills, 1983), 3. 41. 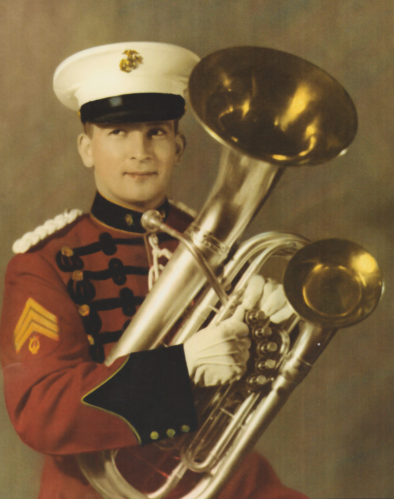 Earle L. Louder, "An Historical Lineage of the Modern Baritone Horn and Euphonium." (Ph.D. diss., Florida State University School of Music, 1976), 32. 45. Brand, Brass Bands in the 20th Century, 42.